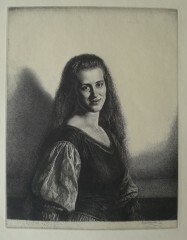 Gerald Brockhurst-Etchings-Original Prints -Art Books- Free delivery. Gerald Brockhurst was a painter and print maker, who was born in Birmingham, West Midlands. Gerald Brockhurst studied art at Birmingham School of Art where he met Henry Rushbury, another artist and etcher. He continued his studies at the Royal Academy in 1907 using the Landseer Scholarship to help him through college. 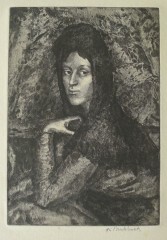 In 1913, he received the Armitage Gold Medal and a Travelling Scholarship that enabled him to visit Paris and Italy to study the work of early Italian painters. On his return, Brockhurst moved to Ireland where he lived from 1915 to 1919, returning to London to live in Chelsea, London. He mainly specialised in portraiture in painting and etching. He exhibited a painting titled ‘Dorette’ at the Royal Academy in 1933, the model was Dorette Woodward. Her often used her as his model and he eventully married her in 1947. Gerald Brockhurst was elected ARE in 1937. In 1939 he moved to New York where he stayed and continued to live. His exhibitions included Chenil Galleries 1915, Royal Academy showed 1923-53.